Land Rover BAR is the British Challenger for the 35th America’s Cup. It is radically changing the sport of sailing from both performance and sustainability points-of-view. Think of Sir Ben Ainslie, the most successful Olympic sailor of all time who, in the summer of 2013, went on to join ORACLE TEAM USA on-board for their defense of the 34th Cup, helping the American team win the event 9-8, against Emirates Team New Zealand, as his sport’s LeBron James or Lionel Messi. Thus it’s a very big deal that, when Ainslie decided to start his own team, he set the bar very high for himself and his team of engineers, designers, sustainability experts and sponsors by taking on, simultaneously, two audacious challenges: 1) For the first time ever, bring the Cup home, and 2) Do so with a team that pushes the sustainability boundaries of his sport in often unheard of ways. GreenSportsBlog is pleased to offer a 3-part series on Land Rover BAR’s cutting edge work at the intersection of Sustainability + Sports, commissioned by the team’s Exclusive Sustainability Partner, 11th Hour Racing. The series initially appears on GreenBiz.com. In Part 2, we dig into Land Rover BAR’s cutting edge work at the intersection of Sustainability + Sports by delving into the partnerships that have helped turn Land Rover BAR into a Green-Sports leader. Part 3 will be an in-depth interview with Team Principal and Skipper Sir Ben Ainslie on his personal journey towards sustainability and on the role that his team is playing in changing the ethos of competitive sailing. In Part 1, click here to see how the team, its Exclusive Sustainability Partner, 11th Hour Racing, and Land Rover itself are using Life Cycle Assessment (LCA) to make the entire operation greener, leaner and faster. The winner of the 2017 America’s Cup, to be contested in Bermuda next June, will immediately attain sailing immortality. The squad that ends up hoisting the oldest international sporting trophy* will be the one that most effectively melds top individual sailors to work together to become the best team. But team in the America’s Cup case doesn’t refer only to those on board. Each entrant in the race has an onshore phalanx of designers, engineers and software experts searching for marginal gains from the best design and most advanced technological expertise to create the quickest boat. Land Rover BAR, as documented in the first article of this series, also has a dedicated sustainability team working to maximize carbon-efficiency, reduce cost and, in so doing, perhaps shave precious additional seconds off of the boat’s time. 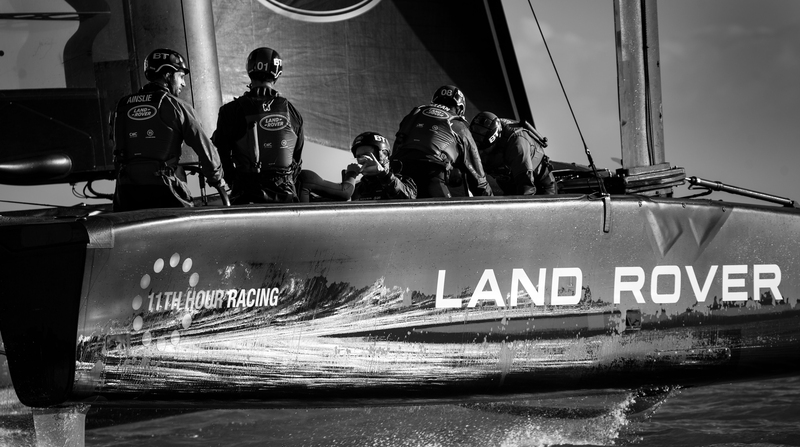 And there’s more: Land Rover BAR’s America’s Cup prospects and its green bona fides are bolstered by a dedicated cadre of corporate and foundation partners. By having these partners collaborate around sustainability, Land Rover BAR has taken a major step forward in the way team sponsorships are crafted and activated. Whether the commitment to sustainability and having a group of like-minded partners will help Land Rover BAR win the America’s Cup still remains to be seen. However it’s fair to point out that sustainability has provided Land Rover BAR with 1) a set of extraordinary partners, 2) a progressive, core element of its DNA—one that binds the entire operation closer together. When one thinks of a typical sports sponsor, the mind may go to a beer brand. Or, perhaps to an insurance company. The mind most definitely does not wander to an organization that, rather than mixing hops and malt and water, or making bets on car accident rates, instead supports winning sailing teams committed to sustainable practices that improve the health of our oceans. That is exactly what 11th Hour Racing does, rather than providing a service or selling a product. It recognizes that sport is a force for positive social change and, that in the marine arena, there is no better platform than a partnership with a top-flight America’s Cup team through which to promote ocean health and stewardship, and find viable solutions to the issues at stake. Given Ben Ainslie’s status as an America’s Cup champion and Olympic icon, and his interest in ocean health and climate change, it’s hard to imagine a better fit. Ainslie took the first step by reaching out to 11th Hour Racing. With an Exclusive Sustainability Partner on board, Ben Ainslie Racing turned to the technical requirements necessary to win—all while pushing the sustainability envelope. They needed to find a partner with stellar design and technical know-how and a best-in-class commitment to the environment. In the case of Coventry, UK-based Jaguar Land Rover, Ainslie didn’t have to look far. With its Above and Beyond ethos, Land Rover lives and breathes advanced engineering, design, and technology every day. The result has been consistent development of world-class innovations and better-performing vehicles that successfully navigate and battle the elements and terrains. Of course world-class racing boats also fight the elements. This helps explain Land Rover’s longtime involvement in sailing. A pairing of Land Rover and Ben Ainslie Racing in a Title and Exclusive Innovation Partnership thus appears to be a tight, organic fit. Sustainability’s central role in Land Rover’s business tightens the organic nature of the partnership: from utilizing Life Cycle Assessment to an aggressive commitment to reduce carbon emissions (30% in manufacturing processes by 2020), Land Rover and Ben Ainslie Racing share best-in-class sustainability track records and a desire to raise the sustainability bar ever higher. Low Carbon, a privately owned investment company based in London, confronts climate change by accelerating the world’s switch to a low-carbon future. How? By investing in, owning and operating large scale renewable energy projects (solar, concentrated solar, wind, anaerobic digestion), primarily in the United Kingdom. And, since Low Carbon signed on to become Land Rover BAR’s Renewable Energy Partner last year, some of that electricity is being generated and used on site, at the team’s headquarters in Portsmouth that was built to BREEAM (UK’s version of the USGBC’s LEED building rating system) standard. The global communications company signed on last fall as Technology in Sustainability Partner. This followed shortly after the two organizations joined forces to launch 100% Sport, a global initiative to inspire sports fans around the world to take action to tackle climate change and reduce carbon emissions by switching to renewable electricity. 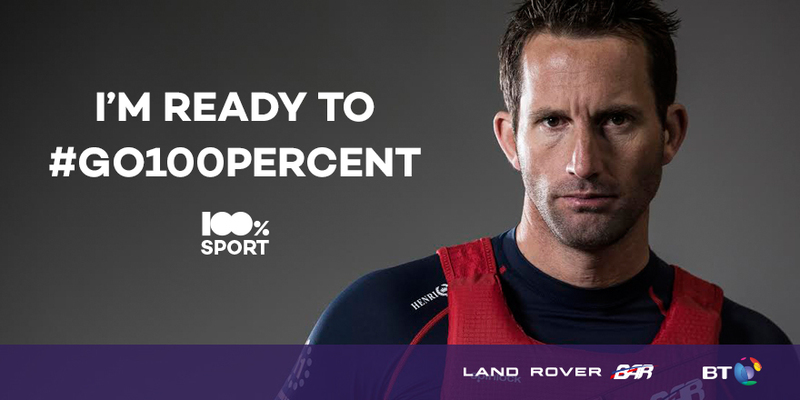 Sir Ben Ainslie, the first ambassador for 100% Sport, launched by BT, Land Rover BAR’s official technology in sustainability partner. 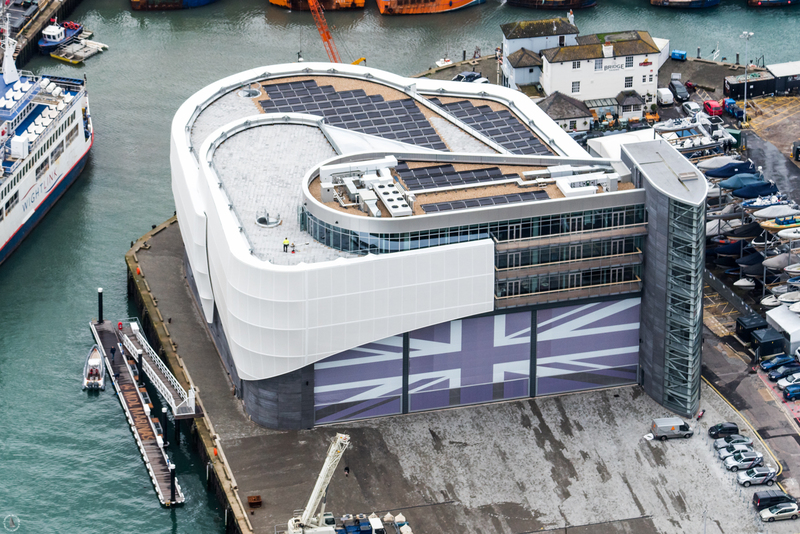 Will Land Rover BAR bring the 2017 America’s Cup to the UK? While there is a long way to go until Bermuda, the team has the look of a serious contender and is off to a strong start: it’s the first team to claim a second America’s Cup World Series victory in the lead-up to the 2017 America’s Cup, having won in the UK in July 2015, and in Oman this past February. Predicting the results of any sports event is a fool’s errand, but one thing is for sure: The way Land Rover BAR is combining its technology, sporting and sustainability efforts through its top-in-class partners will become a model, not only for sailing (more teams will go the sustainability route by the time of the 2021 America’s Cup) but for the broader sports world. In fact, 11th Hour Racing will, on behalf of all of Land Rover BAR’s sustainability partners, lead a session at the Green Sports Alliance Summit in Houston in June entitled “Harnessing the Power of Partnerships: Building a Sustainable Sports Team.” This will show the entire sports world how to go #SailingIntoSustainability.